Xbox One is just announced, while Microsoft admits they have lost the war against Sony PlayStation 4 in the most subtle way during their “reveal event” May 21, 2013. The Xbox One reveal event took place at Microsoft’s Redmond Campus, in case you missed the online livestream, you can watch it on demand here at the Xbox website. During their reveal event, Microsoft put the majority of their focus on making the Xbox One the hub of living room entertainment, rather than gaming itself, and spent a considerable time talking about the user experience. The whole idea behind Xbox One would be “Simple. Instant. Complete.” And before we dive into possible reasons behind this entertainment-centric strategy, let’s have a recap on the specifications of the Xbox One system in detail. First we look at the Xbox One SoC. 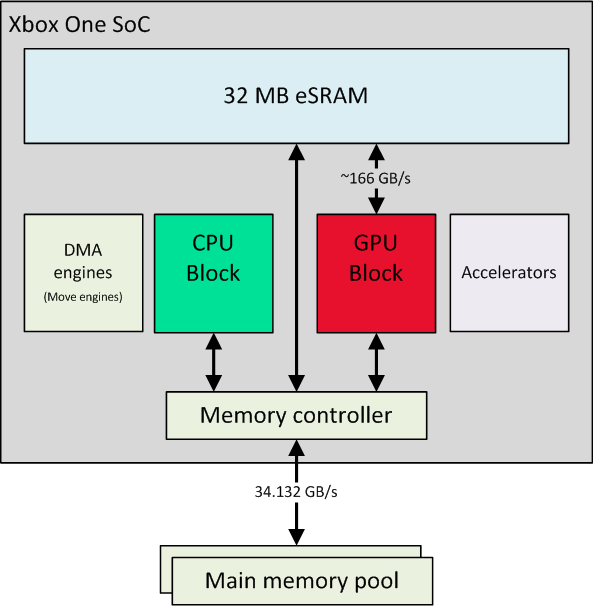 The Xbox one SoC boasts a whopping 5 billion transistors on a monolithic die, the die contains several major important components; the first one being an 8-core Jaguar block with caches, the next being a GCN GPU block with 768 scalar shaders (that’s 12 Compute Units), several move units for direct memory access (DMA) to the GPU, several accelerator blocks including one for audio processing, dual-channel DDR3 memory controller for the whole SoC and a big chunk of 32 MB embedded SRAM (eSRAM) for the graphics block. The eSRAM also connects to the memory controller to get required data from the main memory and store in the relatively smaller eSRAM block, so the GPU can treat it as a very-fast last level cache. The reason for a large transistor count is reflected through one big block, yes, the big block of eSRAM. For a 32 MB eSRAM array, there is 268,435,456 bit cells, for a 6T (6 transistors per bit cell) configuration, it would translate to 1.61 billion transistors, while for a 8T configuration, that’s around 2.15 billion transistors. The Jaguar CPU cores use the AMD64 (64-bit) architecture, the CPU cores also have the ability to do hardware virtualization with nested page tables, which Microsoft said is crucial for enabling the Xbox One operating system stack. The exact GPU specification was not actually revealed during the event, but rather, hints were given by the game developers. There were some clearer hints from the Microsoft Engineers at the technical discussion session after the livestream event. So the GPU can do 768 operations in a single cycle, that means 768 scalar ALUs based off the GCN architecture. We will not point to whether it’s Southern Islands or Sea Islands shaders. Microsoft claims 4 times the calculations per second and 8 times the graphics performance over the Xbox 360 GPU. Going over to the memory subsystem, the Xbox One features 8 GB of RAM, and the large chunk of eSRAM mentioned a few paragraphs above. Microsoft is claiming over 200 GB/s bandwidth for the memory subsystem, it does seem to be inline (and even surpass) Sony PlayStation 4 on the memory subsystem front with eSRAM, but devil is in the details. The Xbox One will continue to have a large local storage, as the console will include a 500 GB, 2.5″ notebook form factor harddrive (SAMSUNG Spinpoint M8 ST500LM012, manufactured by Seagate), the specifications would be 5400 RPM and 8 MB Cache, the harddisk is connected using a SATA 3.0 Gbit/s interface. Attempting to catch up in the physical game media race, the Xbox One will equip a slot-in Blu-ray Disc drive, leveling the playing field with Wii U and PlayStation 4, and Xbox One can also play Blu-ray Moview, catching up with the PlayStation 3. As for the connectivity options, USB 3.0 ports will be on the Xbox One to charge the new controllers and allow access to USB flash memory. The Xbox One will continue to have support for 802.11a/b/g/n and WiFi Direct, an RJ-45 port is also present for wired Internet connections. On the display connectivity front, as the Xbox One shifts focus towards Live TV entertainment, there will be an HDMI 1.4a input alongside the HDMI 1.4a output. Microsoft said the HDMI 1.4a ports are able to transmit 4K video streams as well as 7.1 surround sound. Users can opt for S/PDIF connection to bypass 7.1 surround sound to the home audio amplifier. The die size of the SoC is between “huge” and “gigantic”, a whopping 5 billion transistor figure. Microsoft opts for multiple power states for the SoC to deal with a monster die sucking power. The SoC also features separate power planes for the CPU block, the GPU block, the northbridge and memory I/O, to further reduce the power consumption by allowing independent and dynamic frequency and voltage adjustment. A large heatsink fan is also used to cool down the big chip. Microsoft states the fan will go completely quiet even when going at full speed, to meet the requirements of a living room device. The Kinect got the upgrade, as expected, and supporting capture at 1080p resolution, with a wider field-of-view to allow a maximum 6 people to be detected at the same time, compared to 2 for the previous generation. The sensor can also detect more joints, more muscle movements detection (such as shoulder angles), motion force (like the punching action) and the ability to detect more accurate features such as heart beats and emotions for each person in front of the Kinect sensor. However, the new Kinect sensor will become an integral part of the Xbox One experience as far as the voice command and gesture controls go. Therefore the Kinect is now bundled in the box for every Xbox One systems sold, and required to be connected to the console at any time. And as the new Kinect sensor supports 1080p capturing with a lot more detail, the Kinect sensor will utilize a new connector and cable featuring a different shape and higher data bandwidth, which means the old Kinect sensor will not be compatible with the Xbox One. For the new controller, the ergonomics have been improved, with increased precision and new programmable trigger feedback. The battery pack is also streamlined, giving a nicer look and feel to the controller, the aesthetics also were updated to reflect the change of the Xbox button being moved to the top of the controller. Operating system, Xbox Live and always-connected? Microsoft would be proud. Why? Because they can integrate more of their off-the-shelf products and IP on the Xbox One. The operating system (actually three operating systems) are operated on top of the Hyper-V hypervisor, the first smaller operating system just boots into the main system, and the other operating system would be for the snapping apps such as Skype, NFL player stats, Internet Explorer, and so on. The main operating system is based off a variant of Windows 8, and has an exclusive partition of main memory, Microsoft also touts parallelism at operating system level for the main operating system in their technical session. There is another operating system for the apps that shares another partition of main memory with the main operating system. Microsoft says by utilizing this operating system stack, they can achieve an instant experience, just like switching a TV channel, and attracts more app developers to develop apps for the Xbox One platform. Xbox Live got some cloud integration love from Microsoft with their Azure cloud platform integration, and Microsoft is deploying more datacenters packed with servers. The plan is to increase the number of servers to 300,000 from 15,000 at the moment. With the additional servers that share the computation workloads, game developers can create and host larger online multiplayer events with more players, users will also be able to backups saves and files like recorded TV (after editing with the accompanied basic video cutting tool on Xbox One) to the cloud. The membership levels for Xbox Live, however, stayed the same, so the gamertags and the whole Xbox Live profile for the Xbox 360 console will be able to seamlessly transition to the new Xbox One. One of the most criticized rumors about the Xbox One prior to the reveal event, would be the requirement of an always-connected Internet connection, be it a wired or a wireless connection. Microsoft was being very vague and ambiguous on this during the livestream and the technical discussion session. According to Kotaku, the Xbox One requires the users connect to the Internet once every 24 hours. We think Microsoft will require a connection but does not want to actually tell buyers before they purchase thereby turning off a generation of gamers, or their parents. Throughout the event, only 3 segments were used to give game previews. A total of 21 games were announced in the event, 16 of them are exclusive to Xbox One, while only 1/3rd of the mentioned games had their name’s revealed. Forza Motorsports 5 has been announced as the launch title, while 15 titles from Microsoft Studios were announced, in which 8 of them are based off new franchises, one of them being Remedy Game’s Quantum Break. The most anticipated game would be Call of Duty: Ghosts, featuring higher texture resolutions for characters and large dynamic maps for multi-player mode. Activision will launch the Xbox One version with exclusive gameplay content. The other being a partnership deal signed with EA Sports, with Xbox One exclusive contents for FIFA 14 Ultimate Team. The subtle theme of “We lost the war” was interwoven throughout the whole event. Microsoft had more than three months to properly respond to everything mentioned in the PlayStation 4 unveiling event, which was February 21, 2013, and yet, their responses on all aspects of a gaming console (or even as an entertainment hub) have been lackluster at best. The event didn’t focus on the gaming experience, but instead focused on an attempt to reinvent the wheel on yet another living room device replacement. However, the big, bulky, boring black box (BBBBB or 5B for short) that embraces simplicity doesn’t necessarily fit all households, when small apartments are put into consideration. Compounding the problem, the Xbox One itself cannot replace one’s digital/cable/satellite TV set-top box/integrated digital TVs, so one will have to do HDMI bypass, and one would be seeing five cables at the back of the Xbox One console when one also charges the controller through an USB 3.0 cable. And further adding to the pain is that most of the TV related experience (including the NFL partnership) introduced in the event is for selected regions only (mostly US and Canada), those features would be useless for other regions of the world. Voice command on Xbox One is neat, but is probably limited to English only. Gesture control with gestures like Grab and pan, Swipe up and Snapping is not surprising given Kinect features, while snapping (multi-tasking) is from Windows 8, with Internet Explorer, NFL stats and Skype video call are being demonstrated, the snapped contents are also viewable on Smartglass devices. So far, they are the correct way to simplify and evolve the navigation experience through the menus with Kinect sensor features, but there isn’t enough surprise there. Worse yet, the gesture control on TV is not a first in the industry, Samsung did it for their SmartTV line for quite some time already, and they have even more features like face recognition and a “like” (thumbs up) gesture. Going further on home entertainment, Microsoft did not talk about the timeframe of 4K content (both gaming and entertainment) arriving for users and how Microsoft is going to be prepared for that, 4K content is supposed to go mainstream during the life-cycle of Xbox One, unless Microsoft just plans a 3-year life-cycle for Xbox One and would be readying an Xbox Two in 2016, but that won’t solve the same old problem which the R&D cost of a game console cannot be covered throughout the whole life-cycle. And then, no word on stereoscopic 3D capabilities of the Xbox One either, we suspect it’s due to the fact that the 3D features on Xbox One just stayed the same, that it became pointless for Microsoft to even talk about it. And as we move on the hardware, the dire situation just got worse, the new controller and the Kinect are just slight upgrades to catch up with the current technology, instead of a completely new concept. The same goes to the core of the console. When we are looking at the Xbox One SoC architecture and compare it with the Xbox 360 XCGPU SoC architecture, it’s just a mild tweak more than anything else. The idea is to replace the old PowerPC cores with a more developer-friendly x86 (for cross-platform game development with the PC) and a newer GPU architecture with higher hardware efficiency. The eSRAM can now directly access the main memory, so there is a plus there. It’s, however, unlike the PlayStation 4 APU architecture, that has a heavy focus on GPU accelerated simulations and computations, the Xbox One will not shine on GPU compute heavy workloads, another major feature that game developers actually wanted and focus on, simply because the memory bandwidth available to the whole SoC or GPU compute is just inadequate given the large scale of scalar ALUs present in the GPU. Microsoft does have DirectCompute and C++ AMP for GPU accelerated compute and claims the GPU having coherent memory addressing space, but these are not reflected during the event, nor in any other technical sessions. The death blow would be, none of in-game visuals from the previewed games have extensive use of GPU accelerated features such as physics, unlike the games shown in the PlayStation 4 unveiling event. Adding to the irony is NVIDIA’s announcement of CPU-only PhysX physics and APEX cloth simulation SDKs available for Xbox One console. The monolithic die SoC is simply huge with the inclusion of a large chunk of eSRAM for game developers to manage and squeezing the last bit of performance, through extensive care in the eSRAM utilization to avoid performance degradation. However, judging from the past on the Xbox 360, it will probably just end up as an almost “free” anti-aliasing solution for most of the games, as game developers voiced opposition specifically to this technology to Sony, ultimately driving Sony to completely scratch the idea of using eDRAM for the graphics and instead used a large GDDR5 memory pool with over 176 GB/s bandwidth. As a sidenote, when speaking about the bandwidth numbers, the memory bandwidth on Xbox One does seem to be at the same ballpark as Sony’s PlayStaton 4, right? While Microsoft touts over 200 GB/s memory subsystem bandwidth, so it should be better than the 176 GB/s number on PlayStation 4, right? All wrong. The devil is deep in the details, remember the large chunk of eSRAM for the graphics? So the Xbox One system uses 16 pieces of Micron “D9PNZ” DDR3 memory modules on-board, a little Google search give us the exact model number being MT41J256M16HA-093, which is 4 Gbit density modules running at an I/O frequency at 1066 MHz, that’s DDR3-2133 data rate for those who don’t know, and these modules will provide 34.132 GB/s bandwidth under a dual-channel configuration. And thus, the eSRAM contributes over 166 GB/s bandwidth. However, the two numbers were added up for obvious marketing purpose, and in reality the two numbers should be seen in parallel with each other because, as we mentioned earlier, the GPU will treat the eSRAM as a very-fast last level cache, so the bandwidth here doesn’t serve the CPU cores at all. And as we go back to the features, there is one highly anticipated feature, sparked from an patent application from Microsoft, the IllumiRoom project. The basic idea is to utilize the Kinect sensor to scan the appearances and the geometry do spatial augmented reality, and then projecting visualizations on the surface behind the TV screen, for more immersive and new gameplay experience. However, it remained a research project for the time being while some anticipated that the working prototype would hit the stage as a glimpse of future gaming. With the future of gaming going towards a higher degree of immersion with advanced rendering techniques and display technologies, one would also consider the future of gaming to combine with more social elements. But Microsoft only addressed that with improved achievement portal with dynamic statistics compared to the whole group of gamers, Skype snapping app support, and the trending section like Twitter’s Discover section. Microsoft has not respond to the trend in gaming over the cloud either, although the Xbox Live gets some love from the cloud and Windows Azure integration that can do more, such as finding gamer’s past matches and better multi-player matches experience given the increase in the number of servers for Xbox Live, but since backwards compatibility is out of the equation for both consoles given the switch to x86 from PowerPC architecture, there is still hope for streaming the best games from the past generations on the PlayStation platform. That is, however, not going to happen for the Xbox One platform in the short-term unless game developers are willing to rework the game on x86 platform and make it available for purchase on the marketplace. Microsoft leads Sony on second screen strategy with SmartGlass and more features, and it got a little better with snapping apps support. And that’s the third plus side for Xbox One so far. However, the second screen is meant to provide an extra way of interacting with non-game elements of the gaming experience. Why Microsoft just gave up to battle with Sony? Living entertainment hub and focus on the experience, is the main theme of the Xbox One reveal event, and they did that job fine in conveying their message.